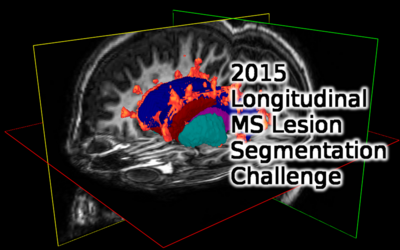 The Longitudinal MS Lesion Segmentation Challenge was conducted at the 2015 International Symposium on Biomedical Imaging in New York, NY, April 16-19. Competing teams applied their automatic lesion segmentation algorithms to MR neuroimaging data acquired at multiple time points from MS patients. Algorithms were evaluated against manual segmentations from two raters in terms of their segmentation accuracy and ability to track lesion evolution. 34 Teams initially registered for the Challenge coming from 15 different countries, representing 27 different institutions/universities. Congratulations to Team IIT Madras (First Prize), Team PVG_1 (Second Prize), and Team IMI (Third Prize and Efficiency Prize)! Information about the data is available here, and the evaluation software from here. This challenge was supported in part by a grant from the National Institute of Neurological Disorders and Stroke (NINDS R01 NS070906). Funding for prizes was provided by the National Multiple Sclerosis Society. This page was last modified on 25 June 2018, at 16:51.